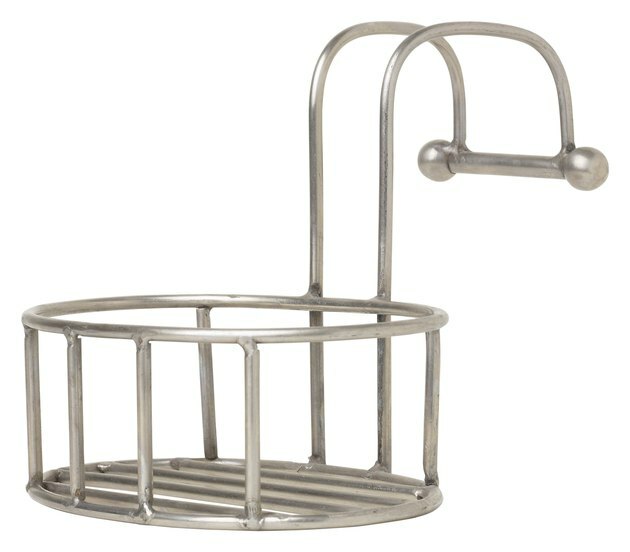 Your bathtub may look spotless, but the rusted shower caddie detracts from the overall appearance. While a shower caddie holds toiletries in place, water trapped by a shampoo bottle or a brick of soap may begin to form small rust stains that spread over the stainless steel surface if it's not cleaned regularly. Eradicate pesky rust stains from your shower caddie so the entire bathroom gleams. Make your stainless steel shower caddie like new by removing rust spots. Remove the rusted shower caddie from the shower head, and take it outside. Brush loosened rust from the stainless steel with your hand. Wet the shower caddie with 1/2 to 1 cup of white vinegar in a sink or the shower, and cover the rust spots with baking soda. Scrub the rust with a nylon scrubber, and add more baking soda and vinegar as needed to remove all the rust stains. Rinse the shower caddie with warm water. Dry the stainless steel surface with a clean cloth. Apply 1 teaspoon of car wax to a damp sponge, and wipe the wax over the entire shower caddie. Allow the wax to dry on the stainless steel for 15 to 20 minutes or until the surface becomes hazy. Wipe the shower caddie with a lint-free cloth, removing the wax and buffing the surface to a mirror-shine.